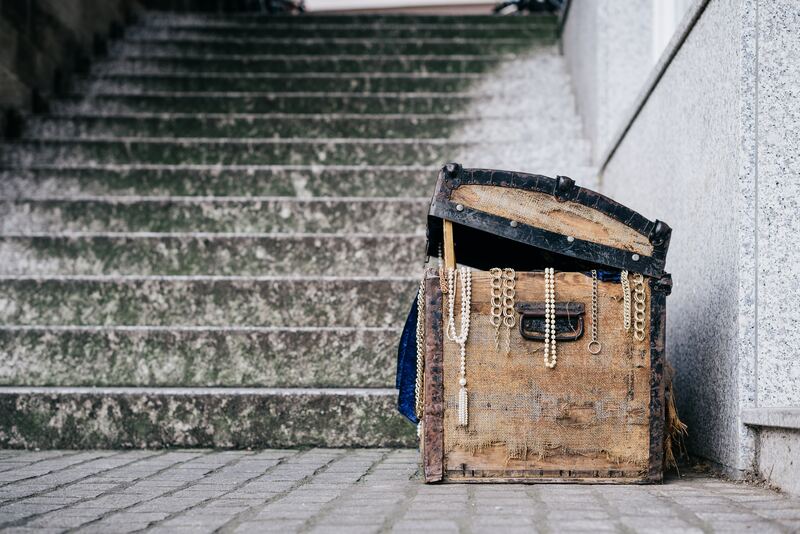 Over 450 exquisite and sparkling pieces of jewellery are yours to own. Jewellery, silver and watches in all shapes, styles and prices are hitting the auction block in Cambridge-based Cheffins’ upcoming sale on 11 April. Over 450 lots are included in the triannual sale, which includes historic and rare items that are set to kickstart the market. This art deco diamond plaque bracelet is the highest value lot on offer within the auction, not surprising given that it has a total estimated diamond weight in excess of 32ct. It was consigned from a private client of Cheffins’, and is thought to date back to nearly a century ago to the 1920s. 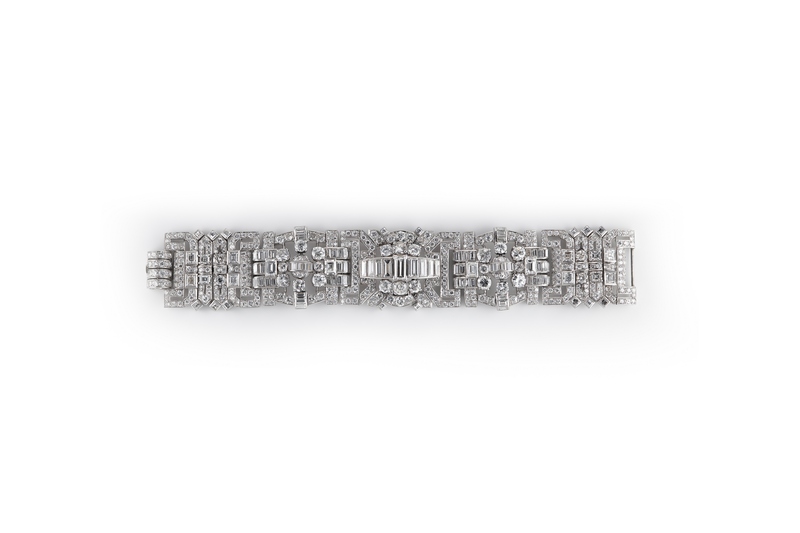 The bracelet is composed of five articulated plaques, the central plaque with nine graduating baguette cut diamonds with three brilliant cut diamonds claw set on each side. 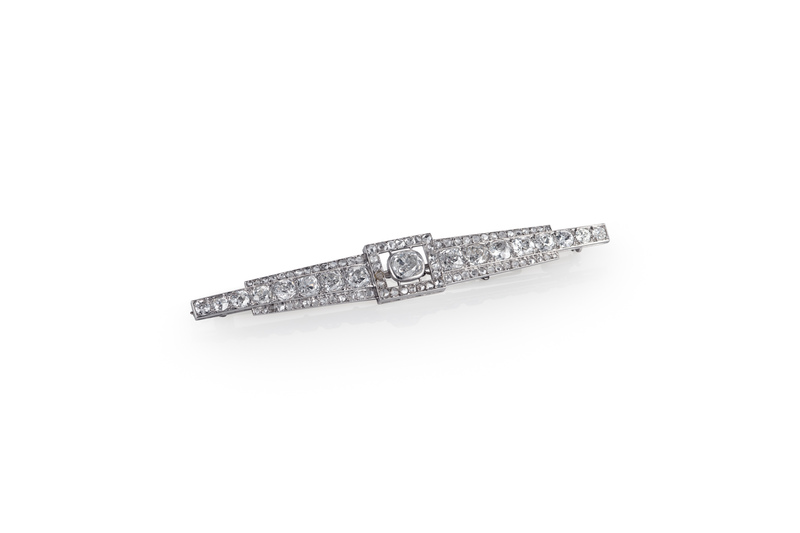 Length is 175 mm, width 30 mm, and weight 93.2 g.
Another art deco piece, this is a French diamond and platinum bar brooch which comes with its original case. The central cushion shaped diamond is estimated to weigh approximately 1.20ct. It is set within an open rectangular pavé set rose cut diamonds. A French dog’s head marks for platinum and the maker’s lozenge on the brooch and French eagle’s head marks for 18ct white gold on the pin. Overall length is 90 mm, width 11 mm and total estimated weight of diamonds is 7.50ct. Another key lot in the jewellery section includes this Belle Époque diamond and aquamarine pendant necklace. 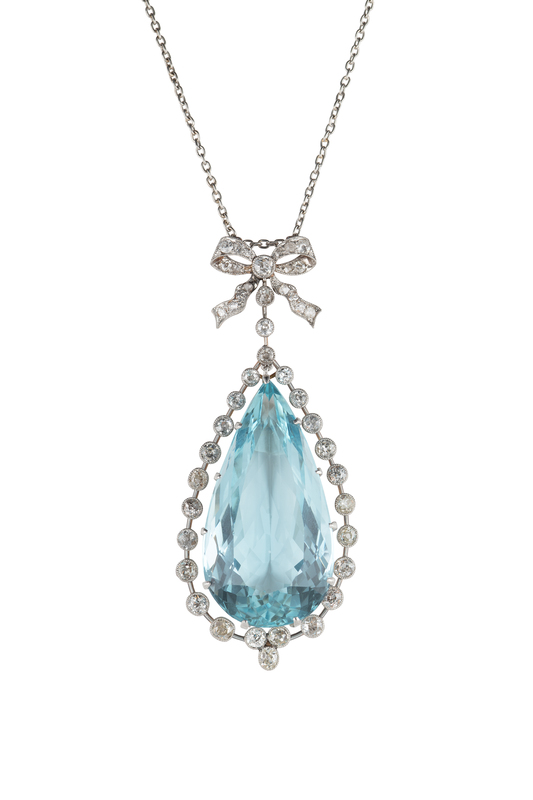 The pear shaped, faceted aquamarine alone is estimated to weigh in excess of 40ct. It is displayed in a simple claw setting suspended within a knife edge frame of 25 individually millegrain set graduating brilliant cut diamonds. These diamonds, weighing an approximate total of 2.25ct, are suspended from a diamond set bow, free running on a trace link chain with bolt ring fastening. Length of chain is 43 cm and the pendant is 6.5cm. If blue’s your colour and you’re after another shiny gem, this sapphire and diamond cluster ring might just do the trick. 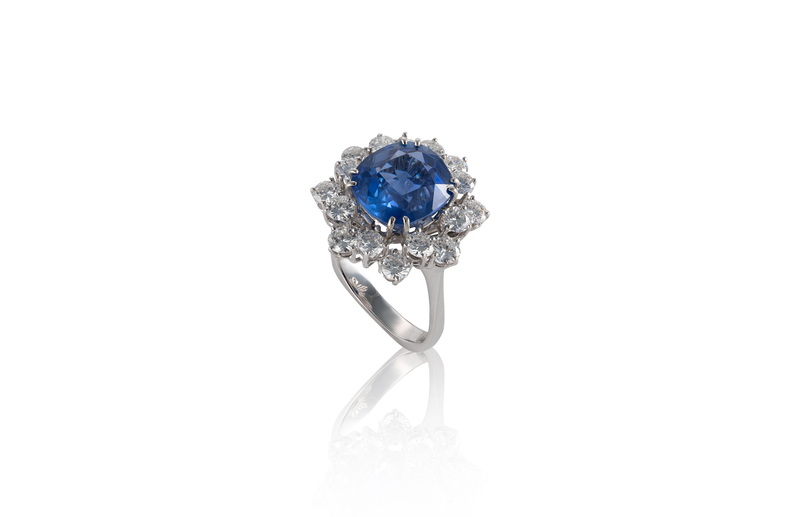 The ring features an unheated and certificated Sri Lankan sapphire which weighs 7.15ct. This rectangular cushion shaped mixed cut sapphire comes with a double claw set within an undulating border of 16 claw set round brilliant cut diamonds in a basket setting. The unhallmarked white metal is stamped ‘75-’, it is size I-J, and the estimated weight of diamonds is 1.70ct. The ring is presented with a certificate from the Gem & Pearl Laboratory of London, dated 16 September 2016. The most historic watch is this Omega Air Ministry gentleman’s timepiece from c. 1940 which was the property of late acting Squadron Leader V.C. Royals who served in Egypt, Malta, the Middle East, North Africa and Sicily. The watch is one of the few remaining which were issued by the Air Ministry during WWII from Omega for pilots and navigators in the RAF. The military coding to the case back, '6B/159', specifically relates to this use and the 'AM' initials are an abbreviation of 'Air Ministry'. The watch has a signed circular off-white coloured dial 30 mm in diameter, with black Arabic numerals, blued hands, centre seconds and chemin de fer chapter ring. 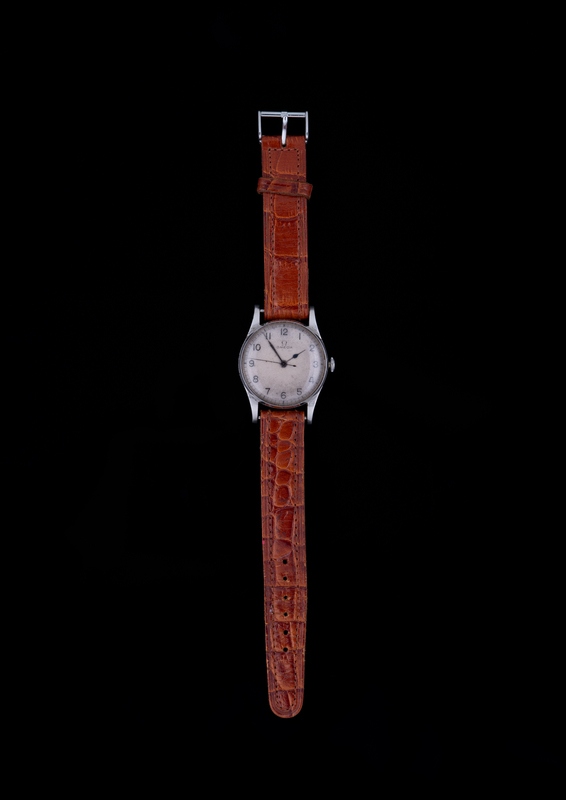 Other watches within the sale include a series of vintage Rolexes, dating from as early as 1916 through to the 1950s, as well as pieces from Tag Heuer, Ebel and Omega. There are also several pocket watches available and a series of women’s wristwatches from Omega, Longines, Rolex and more. As a reminder, the Cambridge sale will be taking place at Cheffins on Thursday 11 April from 11am. Viewing starts on Monday 8 April.